Aly Raisman talks about how seven-time medalist Shannon Miller inspired her in the '96 Olympics. As the final note of her floor music played inside Rio's Olympic Arena, Aly Raisman clutched her chest, tears rolled down her cheeks and pride filled her eyes. The emotion of the moment, of all that had gone into fulfilling her dream of returning to the Olympics and having another shot at an all-around medal -- a dream she shared with her longtime coach Mihai Brestyan but rarely anyone else -- overwhelmed her. "It was very special," Raisman said. "It's a moment you only dream of in your wildest dreams. The crowd was screaming and yelling, and I finally did it. I was so proud." Raisman's tearful exit from the floor was a beautifully rare moment in the stoic sport of gymnastics, and few who witnessed it firsthand will likely soon forget. Two years ago, when Raisman made the decision to return to gymnastics, she couldn't imagine herself competing in the all-around in Rio. Back then she was just trying to convince her detractors -- and herself -- that she and Gabby Douglas weren't crazy for trying to make a second Olympic team after taking a year off from the sport. In those years, routines had become more difficult, and a young gymnast from Texas named Simone Biles had bounded onto the scene. Besides, Raisman would be 22 in Rio. Didn't she know that's ancient in the sport of gymnastics? 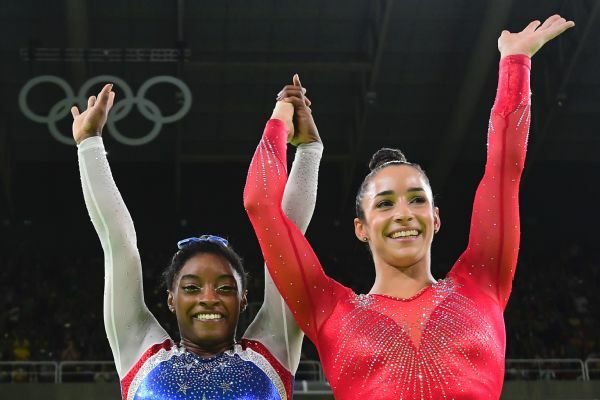 "I feel like I'm better now than I was in 2012," Raisman said Thursday after taking silver in the all-around. "I'm very proud of that. It's obviously not something people expected or that's easy to do after taking a year off and being the 'Grandma,' as everyone likes to call me. I'm happy I proved everyone wrong." Four years after narrowly missing the all-around podium in London because of a technicality, Aly Raisman got her redemption with a silver medal in Rio. In the lead-up to 2012, as in 2016, few expected Raisman to qualify for the all-around. Back then, reigning world champion Jordyn Wieber was favored to win, and Douglas was hot off a win at trials, but it was Raisman who finished first in qualification. She and Douglas took the top two spots for Team USA, and Douglas, of course, went onto win. But forgotten in the celebration of Douglas' success is Raisman's heartbreak. In the final rotation, Raisman made a mistake on beam and tied Russia's Aliya Mustafina for third. She lost the bronze medal to Mustafina on a tiebreak. She has had four years to think about that day. "It was heartbreaking and devastating. But everything happens for a reason," Raisman said, lifting her silver medal to show a crowd of reporters. "I didn't know the reason until now." "Is this redemption?" a reporter asked. "Yes," she said. "Yes. Yes. Yes." If there was a moment Thursday night when Raisman's redemption didn't seem a sure thing, it was after the second rotation. Raisman and Biles headed to beam in fourth and second places, respectively. Raisman thought back to 2012 and the beam routine that cost her a medal, to the philosophy she and Biles share to "break the beam" and land each skill with aggression, confidence and belief, to the thousands of routines she had done in the gym and why she'd sacrificed so much to get back to this moment. She had a redo in Rio, and she wasn't about to waste it. She wasn't going to allow a ruling to decide if she took silver; tonight, and with this beam routine, she was going to put enough distance between herself and Mustafina to win the silver outright. 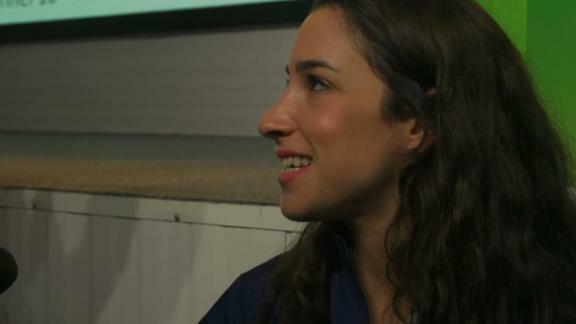 "I made myself a little angry before beam," Raisman said. "That's the best way to do beam. It's important to fuel yourself with some devastating things, but I also realized that if I daydream about doing well and having this silver medal, it's more motivating than focusing on the negatives. So I learned to focus on the positive." She didn't have to look far to find the silver lining in her silver medal. 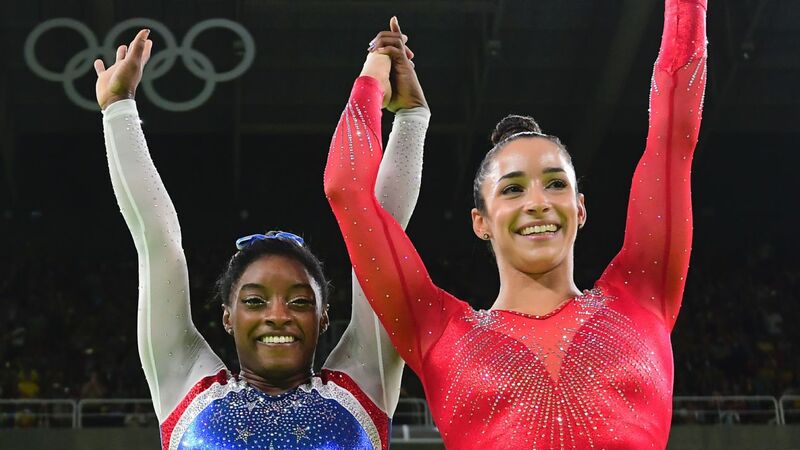 In a world in which Simone Biles competes, Raisman said taking silver felt like winning gold. "I know I can't beat her, so we're not competitive with each other," she said. "We're lucky we have each other. We kept hugging and saying we love each other. It's so nerve-wracking. Sometimes you just need a little love." With her win, Biles cements her legacy as the greatest of all time, but Raisman's name should be included on the lists of the best ever, if not for her Olympic medal haul then for her consistency, difficulty level and longevity in a sport in which that word is rarely uttered. That her teammates call her "Grandma" is less an indictment than recognition of her rarity. 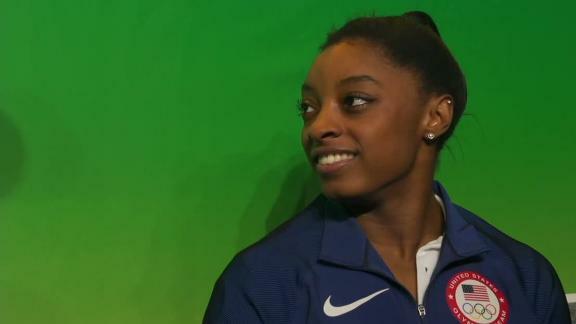 "I think I was more proud of Aly getting silver than me gold," Biles said. "She's worked so incredibly hard during her comeback. She's one of my role models, and I don't think there's anyone I'd rather share the podium with. I'm more happy for her than I am myself." After the medal ceremony Thursday, U.S. team coordinator Martha Karolyi called Raisman one of her favorite gymnasts of all time. "Because she is very talented, but more it is her dedication, hard work and willingness to sacrifice in order to become a better gymnast," she said. "It is to admire." Added Brestyan: "Me and Aly, we know all the time, we are the underdogs. And the underdogs, sometimes, we bite harder."